“I thought I told you not to help.” The soldier grinned and replied, “What did I do?” Whereupon the dark-haired soldier mocked, with heavy sarcasm, “What did I do,” and sullenly accepted a guitar from a smiling bandleader. Hal B. Wallis, the producer, approached as Mr. Taurog broke off the eulogy to confer with him. Presley returned to his bar stool to chat with his co-star, Julie Prowse, who was adorned in flesh- colored tights and beads for her role of the night-club singer besought by Presley. He denied he would sacrifice his singing career for acting. He liked singing too much, he explained. All kinds of singing. “The other night at the Milton Berle show–you know his night- club show–he put on six opera singers,” said Presley. “I flipped my lid. They had great voices, great arrangements.” With regret, he confessed that while he was stationed in Germany with the Army, he had not been to any opera. “I was just too tired at night to go anywhere,” he said sadly. He could see no sense in reports that rock ‘n’ roll music was dying and he said it was ridiculous to think that the success of this sort of music was due solely to payola to disk jockeys who plugged rock ‘n’ roll records. He grinned broadly. “There’s a little difference now. A little difference in tactics. A little difference in maneuvers. Elvis returns to movies after Army Discharge. 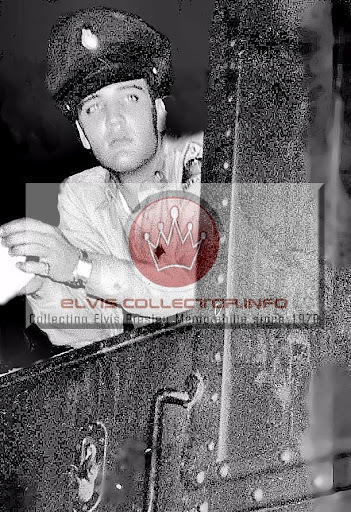 via Elvis returns to movies after Army Discharge.